This is so pathetic. You’re from (I’m assuming) America, Robert. Land of the free, home of the brave! A land where, in 1810, a proposed constitutional amendment would have revoked the U.S. citizenship of any social parasite accepting a title of nobility from a foreign power. It wasn’t ratified, although I see the Iowa Republican party has been plumping for it, apparently in a moronic bid to embarrass President Barack Obama for accepting his Nobel Peace Prize. This means I can’t pass your name on to the FBI with a request to have you flogged. However, if the Iowa Republicans ever take over, just wait. “So what?” you say. “I pine for that title.” Very well, I’ll tell you how to get one. However, I warn you, it’s going to take more than sending 30 pounds to some scammer in the U.K.
• Traditionally, the term for a landowner in Scotland—any landowner in Scotland—is laird. • Etymologically, laird is equivalent to lord. • Historically, the spouse of a lord is a lady. 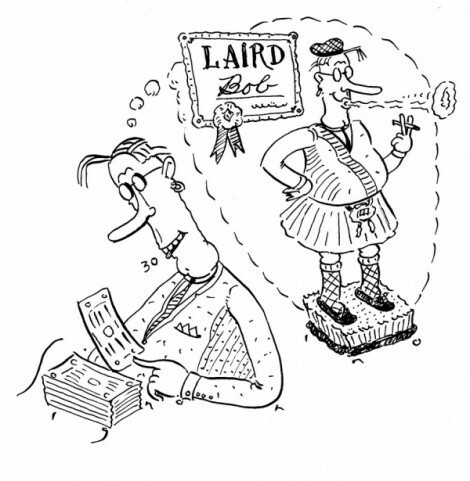 If I pay the 30 pounds, can I use the title “Lord,” “Laird” or “Lady”? Of course. While you’re at it, you can also style yourself the Duchess of Windsor, Pluto the Wonder Dog and Emperor of the Sun. It’s not like the Scottish nobility police are going to come over and bust you. By the way, just so you understand what motivates the people offering this fabulous deal: Farmland in Scotland currently sells for about $6,500 per acre. 30 pounds per square foot works out to $2.1 million per acre. Will I actually own a square foot of land in Scotland? A contract’s a contract, so if we assume the best, technically, you will. However, according to the Court of the Lord Lyon, which is responsible for administering heraldic arms in Scotland, these minuscule land sales aren’t legally recorded. So while you may be a Scottish landowner, the only ones who’ll know will be you, the party that sold you your mini-barony and whomever you tell. If that’s worth 30 pounds to you, be my guest. For the sake of argument, though, let’s assume you’re not a chrome-plated dumbass and you want a genuine title in the U.K. You’ve got two choices. First, a feudal Scottish title, a handful of which come on the market each year. In 2003, the Barony of MacDonald, which included the ruins of a castle and four acres of land on the Isle of Skye, was sold for a reported %uFFFD750,000. The second option is more involved. The U.K. grants nonhereditary titles known as life peerages. Mostly these go to politicians, judges and so on, but it’s possible to get one purely by reason of civic virtue. For example, last year, Nat Wei, a social activist and reformer, was named Baron Wei of Shoreditch. One complication: You have to be a U.K. citizen. On the plus side, you get to sit in the House of Lords. This, in my opinion, is a much better system than buying or, for that matter, inheriting a title. You want recognition and respect? No problem, amigo. Just make the world a better place.